The modern day moose hunting season in Maine was established in 1980 as a management tool for the state to control the quickly growing moose population and ever increasing moose/vehicular collision problems. In the years since, the split hunting season has become a huge part of the local culture and provided both resident and non-resident big game hunters with some truly remarkable trophy opportunities. In recent years the cow hunting seasons in the Northern Zones have been added providing even more hunter opportunities. 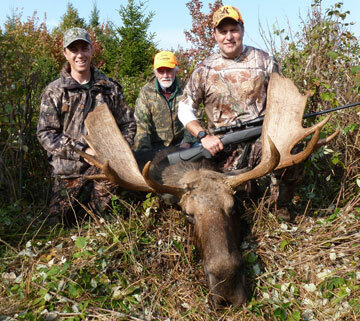 Moose hunting in Maine provides the best opportunity for a big game hunter to take a trophy class Bull without the expense and traveling to the far reaching destination of the Alaskan Yukon. Antler spreads of 57 inches or greater are recorded from trophy Bulls in the state of Maine every season. Combined with the great head gear that can come on these animals are some massive body weights brushing upwards of 1400 pounds on the hoof. Here at Ross Lake Camps we took the 6th largest in the State in 2005 with a dressed weight of 1029 pounds. Hunting success for these animals in Northern Maine runs very high, particularly in the zones that are hunted here in the “North Maine Woods”. This is an area encompassing more than 3,500,000 acres of private wilderness to hunt on. Wildlife districts 4, 1, 2 & 5 encompass the northwestern quadrant of Maine that is all wilderness forest area owned and operated by the major logging and paper companies in the region. Lodging facilities are very limited. You will not find a more experienced, successful and professional group of guides than we have on staff right here. We provide our customers with a whole package experience at Ross Lake Camps. Our location puts us right in the middle of a true wilderness jewel that most people don’t even know still exists in modern times. The cabins are traditional wilderness sporting camp style, rustic and comfortable. Meal service is first rate home cooking served in the main lodge house. Guide service is provided on a “one on one” basis to ensure every hunter of a quality hunting experience. We have all boats, motors, canoes, 4 wheel drive vehicles, and recovery gear to make your trip a success. Please contact us for further information on booking your Once in Lifetime Moose Hunt. Ross Lake Camps is located on Beautiful Chemquasabamticook Lake in the North Maine Woods Region West of the Allagash Wilderness Waterway, a Place Few People Ever Travel or Even Know They Can Access. A True Wilderness Beauty Consisting of Pristine Trout Waters, Thousands of Black Bear, Trophy Sized Moose and Some of the Biggest Whitetail Bucks Found Anywhere in the World. All cabins are equipped with gas lights, cook stove, refrigerators, and a wood stove for heat. There are several outhouses located on the property, and a central shower house heated in the chilly fall season. Both Housekeeping and American plans are available. Meals are served in the dining room of Chemquasabamticook Lodge. To inquire about any plan or hunt or to make a reservation please click here. © Copyright Ross Lake Camps All rights reserved.